Superman thinks back over the events of the past few days and the death of this world's Superman. He stands over the half finished crypt and is lost in thought, until he realizes Lana Lang is underground breaking into the crypt to keep a promise. Seeing Clark in the shadows Lana immediately assumes it's the Clark of this world and hugs him until she realizes he is the mysterious 'pretender' that was there during the final battle. After initially tearing strips off him for pretending to be Superman she is also taken aback that he knows her name and is strangely familiar. Upon questioning, Clark reveals he has been waiting to see if this world's Superman would return. Lana reveals she made a promise to her friend that she would bury him with his Earth parents. Clark explains how he fought Doomsday, not a virus but a beast and how he fell. He explains to Lana that he returned from certain death with the aid of Kryptonian artifacts which are unfortunately inaccessible to him as far as his original Earth is concerned. Lana begins to access information somehow imparted to her from her Superman, she asks the new Superman if he too had a Fortress of Solitude. Superman points out that though he did he's never visited upon principle that this version of his Fortress wasn't his to visit. Determined to find out if the artifacts exist on this Earth, Lana demands to be taken to the Arctic. Both Lana and Superman are taken aback by how epic a facility it is and set about hunting for the regeneration matrix. The Fortress robots cannot find a single trace of it but while browsing Clark discovers the Crystal Font, the holographic player that uses sunstones to store zettabytes of historical data. The Font recognizes the new Superman as Kryptonian and plays a message from the previous Superman intended for Kara telling her to fulfill her potential. Clark is shocked by what he sees next and is disappointed in himself for never having thought of it. The central statue once had just Superman's biological parents holding up a globe. This Superman however updated the statue to include the Kents. Superman aids Lana by secretly stealing the body and fulfilling his dying wish to be buried with his parents. Lana asks for some alone time to finish the burial in Smallville herself. Clark adds a special memorial addition to the Fortress, a statue of the fallen Superman and realizes he should finally take the mantle of his predecessor and become the one true Superman. Story - 5: You can't tell me that even just a little... this issue touched you in some way. What a bizarre rush of emotions Clark must have felt, waiting essentially in a strange out of body experience, to rise from the dead. Matrix, Steel, Eradicator and The Kid were all there when he came back and this time there is no one, except Clark's oldest friend arriving to keep a promise. To see it happen again but this time have no way back and know that if it had been him there would have been no happy marriage with Lois and no son. I like that he embraced the changes and adapted to them in a very natural way, though I don't think he needed Lana to goad him into searching for the Regeneration Matrix. I liked that Lois and Jon were not in this issue, we seldom see Lana, and even more rarely ANY reference to Martha and Jonathan. To see the Fortress monument evolve into a true homage not only to the lost Superman but embracing both Pre-Flashpoint history and the new earth's was both clever and emotional. Everything was on point, every speech, every monologue, it played out exactly as I thought it would, should and did. Peter J. Tomasi has proven time and again, especially in Superman/Wonder Woman (which was sadly often overlooked), that he can really write Superman, not only on an action level but an emotional one too. Lana needing time alone to bury Clark with his family really had my stomach in knots. Clark's decision to pick up Superman's mantle is dealt with in a sensitive way and felt like a natural direction and progression rather than a forced change as has happened in Batgirl and Grayson. 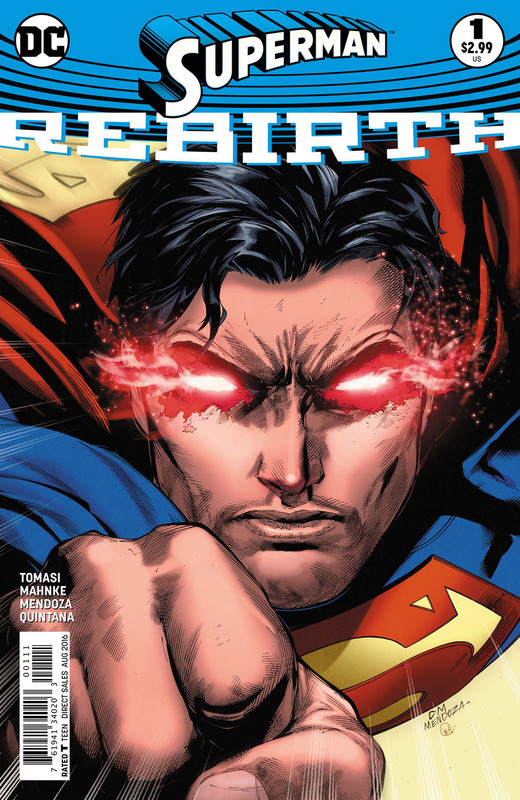 Tomasi, please don't leave Superman anytime soon, you've got me looking forward to new comic book day again. I hope you'll help Superman soar once more. Art - 5: Doug Mahnke, now free of the superfluous armor and the T-shirt, can really let loose with a more defining and recognizable Superman. From the facial expressions of the mourning Lana to the tormented Clark through to the action scenes, such as that absolutely stunning retelling of his battle with Doomsday... Manke delivers some absolutely amazing pages. I wish this issue gave him the opportunity to see the new suit, but then perhaps we'll be spoilt. 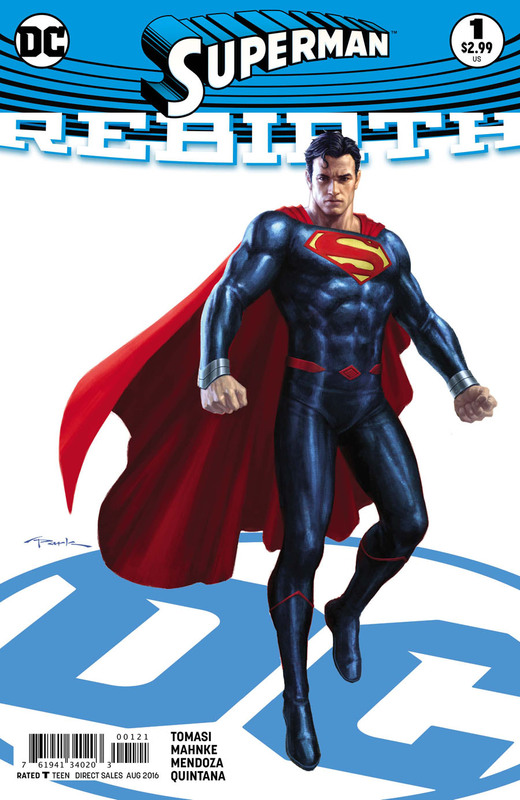 Cover Art - 4: Of all the close up covers of the new Rebirth characters, this is by far my favorite. It has gusto, attitude, energy, a determination to be great again after 6 years of being continually browbeaten to the point they killed him. This shows a return to greatness or at least to me there is a feeling of that bravado. I have to knock it by one point because they still went with the angry glowy eyes - but see below it is almost an all round 5/5! Honest! Variant Cover Art - 5: Since the tease a while back I thought this was a brilliant evolution of the suit, many won't agree but that's why we have the comments section. Gone is that bizarre armor littered with all the lines, the collar and the strange backhand covers. Now we have Clark White sporting a fabric costume once more but without the red shorts, so it's still close to Superman's look of this earth. Added to that it incorporates little hints of Michael Wilkinson's movie suit designs so it is familiar across the board much like Supergirl: Rebirth had taken all the elements of Colleen Atwood's for her book. So we have a merger that pulls in all the elements and Park shows us that it really can work. Print Ad - 5: We don't tend to review print ads but I must say I've thrown this in because it is a truly evocative ad. Remember the first time you came across Superman? Perhaps watching Superman: The Movie? Well, I feel like that kid again. The cover within the ad as a whole gives it a heartfelt new dimension that is what I feel Rebirth is all about.